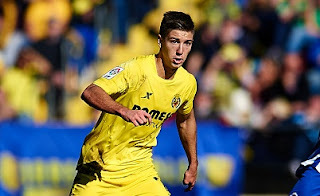 Arsenal and Liverpool to fight for Luciano Vietto Arsenal and Liverpool are set to fight for Villarreal star Luciano Vietto as the reports today revealed that a bid around €20million is set to launch. Arsenal and Liverpool are set to fight for Villarreal star Luciano Vietto as the reports today revealed that a bid around €20million is set to launch. Vietto impressed at La Liga outfit after scoring 20 goals in just 27 start in all campaigns. He was not on the English papers for the past months but now he will not be going away from the news as Arsenal and Liverpool have entered the race to sign him. Villarreal sealed his move last summer and have no plans to sell him but the player will be keen to join a Champions League side. His current contract will expire in 2019. With just €20million buy-out clause both the Premier League sides will be trying to seal his deal as soon as possible. The 21-year-old is also being eyed by Atletico Madrid as the boss Diego Simeone is keen to strengthen the attack. However, Vietto told the media before attracting the English sides that he would like to join Atletico Madrid. The striker will have to pick either Arsenal or Atletico Madrid, he might not consider a move to Liverpool due to Champions League football. However, Liverpool would still remain keen on his move as they are in need of fine striker for next season.